Hello, everyone! I'm back from vacation... did you miss me? 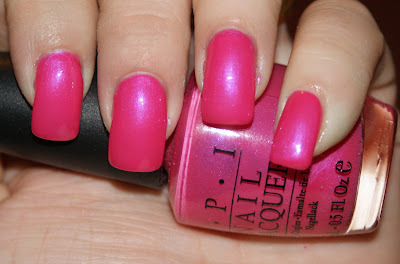 Today, I'm bringing you an oldie-but-goody, which shares a name with one of my favorite Beatles songs: OPI Strawberry Fields! A cerise pink with some iridescent shimmer, it's not too bright or Barbie-ish that I feel ridiculous wearing it. It flattered my skin-tone and gave me an AWESOME idea for some nail art that you'll see at the end of the week! It's also what I wore for my entire vacation time! I am so glad to be back on track here on the blog, though my workspace is full of pigment, base, glitter, and the rest of the materials in the Princess Polish factory! The pre-ordered packages should start to go out at the end of the week, though I'm not sure exactly when the official shop opening day is going to be. Look for that to be sometime next week. I'll make an announcement on my Facebook page! I'm in the middle of mad swatching tonight and tomorrow, as a ton of my pictures were somehow erased off of my chip. :-( But I should be caught up by Wednesday morning! this is my FAVORITE OPI color, but no longer available. my bottle is almost empty, I would love to know if another color is comparable!